Between 50% and 66% of your games are played after your sideboard enters the fray yet it is an often overlooked aspect of deck building on every level. From League events to Pro Tours you can find multiple examples of people that dedicate far too little time to understanding and optimizing their sideboard. This article will go over the general theory behind sideboarding and then go through the most interesting cards for sideboards in every color. One thing new players will often hear is “That card should be in your sideboard.” Why is that? Usually it is a card they will strongly defend since it has given them many wins already. But what they fail to realize is that it has given them many wins against a particular opponent. In the real-life case, this is often the person they tested with the most. And that is exactly what a sideboard card should be: A very strong weapon against a specific opponent. A good sideboard card aims to attack a strategy at a weak point or to attack it in a way it is not prepared for while being suboptimal or even useless against other decks. A perfect example is Negate, against a deck that needs to cast noncreature spells to win it can be a very strong spell yet it is useless against a deck with almost only creatures. First up is the example we just mentioned, spells to fight a particular type of cards. This can be Negate for noncreature spells, Essence Scatter against creatures, Forsake the Worldly against artifacts or enchantments or even lands with Violent Impact. These are “silver bullet” type of cards that are generally useless against some or even most decks. In some extreme cases these can be selected to fight only a particular card or playset in an opponents deck. Second are counter strategy based sideboard cards that aim to shutdown a certain path to victory for a deck. Self-Assembler is an example here. It aims to attack decks relying on 1 for 1 removal spells for survival, like most control decks do. Third are anticipation sideboard cards or counter-counter sideboard cards. When playing God-Pharaoh’s Gift, for example, you can assume your opponent will bring in artifact removal, currently the creatures that can do that are uncommon or bad so bringing in Negate against those cards will help you execute your game plan unimpeded. People often focus purely on the limit of their sideboard, being 15 cards, to decide what to put in there. There are more factors at work, though. The number of cards you want or need to take out of your deck against a certain opponent should influence your decision. The impact the sideboard cards have on your chances to win are nearly equally important, and last but not least, the chances of meeting a certain deck are important. When combined it all makes sense, you don’t need 8 sideboard cards against a pet deck that only one person plays against which you don’t have any cards to take out of your main deck. Break that up in the different reasons and use those to assess all your sideboard cards and you’ll get a lot further. If certain decks get really popular it is sometimes a good idea to put narrow cards in your main deck. If you find cards that have cycling to do so you are not even really losing a card by doing so when it turns out to be useless in another match-up. Forsake the Worldly in control decks is king in that regard. This is something that is rarely correct outside of Control decks that can afford spending a bit more time to find the card they are looking for, so just forget you read this. In Gentry is is usually correct to dedicate all your rare and Mythic slots to your main deck. Therefor the list below will try to avoid talking about cards that aren’t common. Caught in the Brights is good against decks that aim to play big creatures or creatures that can be recurred from the graveyard. Especially in decks that play Vehicles it can be a flexible answer against the Gods, for example. Compulsory Rest does the same for a mana less but does not offer the same potential against recursion. Forsake the Worldly and Fragmentize are the go-to answers to artifacts and enchantments. The specific target you have in mind will push you towards one or another. Slash of Talons can be an answer against very aggressive decks if your deck does not have access to better options in black or red. 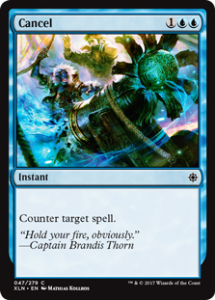 Blue has a great advantage in sideboarding because it is the only color that has counterspells. These are partially balanced by what they can answer. After playing a game the player will now know better what they need to fight and have a broad selection of counterspells at their disposal. 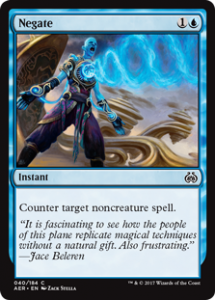 Cancel, Countervailing Winds, Essence Scatter, Metallic Rebuke, Negate, Revolutionary Rebuff and Spell Pierce are all cards that might pop out of a blue player’s sideboard based on what they think is most threatening. The largest disadvantage for blue is that it gets no removal so it is forced to use bounce like Select for Inspection and Unsummon or “freeze” effects like Unquencheable Thirst as pseudo removal. This is rare, since blue usually gets paired with another color to get access to removal. Bastion Inventor and Striped Riverwinder are both annoying threats to other Control decks. Their hexproof dodges the most used way for these decks to interact, by casting removal spells. Finally Dive Down is a very broad protection spell in case there is ever a blue deck build around a certain creature surviving but they will likely prefer Spell Pierce and Negate over this effect. Contract Killing, Final Reward and Tidy Conclusion are unconditional removal spells that each offer their own extra. They are generally not good enough to be played but if the three Gods get played more (and they probably should) then Final Reward’s exile clause might push it into more sideboards. Daring Demolition will likely remain the first card people look at for a broad late game answer, though. Finally we have Vanquish the Weak, in case you need some more removal for early to mid game. Costly Plunder, Fortuitous Find and Resourceful Return are ways to fight through removal in a slow, card advantage based way while Rush of Vitality, Supernatural Stamina and Without Weakness aim to win that battle on the stack. Black is the only color that gets to attack the hand and does so with the precision of a surgeon’s knife in Duress or the bluntness of a sledgehammer in Unburden and even Mind Rot, both are ways to fight specific decks. Ruin Rat and Scarab Feast are two ways to interact with the graveyard, another thing that is almost exclusively available to black and remains one of the ways to fight back against God-Pharaoh’s Gift decks. 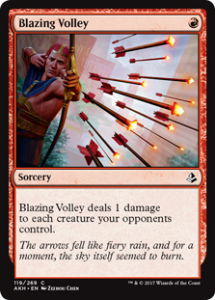 Blazing Volley is the only common sweeper card that is left in Gentry. It alone will stand guard against hordes of servos and other 1 toughness monsters aiming to swarm the board. Destructive Tampering serves double duty. It can be a finisher against decks that clog up the ground or offer relief against a deck that relies heavily on artifacts. Flame Lash is the best removal spell or finisher if you don’t mind spending partity in mana for your damage. Magma Spray and Shock are ready and waiting to round out your removal suite. Shock can go to the face or help in taking out a Planeswalker while Magma Spray has that Exile clause that is so good against certain decks. Puncturing Blow is red’s answer to big and recurring threats but usually only control decks have time to use this. Violent Impact gives you an out against lands and artifacts, and with the transform “quest” cards in Ixalan, that turn into pretty crazy lands, I suspect this will get played a little more than it used to. Welding Sparks is a narrow answer for a specific deck. Red based improvise decks usualy have betteroptions, though. Wrangle and Hijack are ways for decks that aim to fight a ground based battle to break the stale mate, add in a Fling or two wand you have the potential for the core of a deck. Ambuscade, Pounce, Rabid Bite, Cartouche of Strength and Prey Upon are all iterations of the same effect, green removal. So far, Rabid Bite has been the most played one as it gives the most safety when casting it, but Pounce’s instant nature might turn that around. Appetite for the Unnatural is the default unconditional artifact and enchantment removal spell for green. 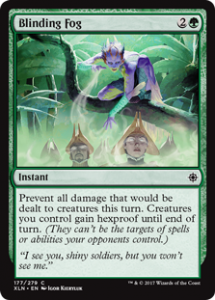 Blinding Fog is a way for green to fight through a lot of different problems, ground stalls, red sweepers and big Alpha strikes with combat trick back-up being the dream scenarios to case the Fog in. Commencement of Festivities might seem the same but worse but it is better when you are in that ground stall in a defending position. You get to make the good blocks while disregarding your life total, perhaps even prompting your opponent to go for lethal with that pump spell to make your Festival even more juicy. Haze of Pollen is another option, it is the least capable of dragging out a big advantage but its cycling makes it useful even when you are ahead. Crushing Canopy is our current iteration of green’s hatred for big Flying creatures. The flexibility of taking out an enchantment is gravy on top even if there should be a better option for you available. You could also pair it with Dissenter’s Deliverance to get a more complete package to replace Appetite for the Unnatural. Another option here is Natural Obsolescence for artifacts that might get recurred or even have in built recursion (not an issue now, but who knows what might be hiding in the future). Stinging Shot is another option to fight back against flying creatures and is obviously better if you are fighting a swarm rather than a dragon. And finally we have Take down if you are expecting both and aren’t sure what is more urgent. Life goes on is a narrow yet cheap way to turn the tides against mono-red decks that are in burn mode to close out the game and can become a 3 for one with burn spells. Ornamental Courage is a surprisingly good spell that drastically alters how close races are played out all the way into the late game. For a 1 mana card it does a lot, especially in tempo games. Compare it to Spidery grasp, and the choice should be clear. Self-Assember is the sole place holder for this entire category, but as I have mentioned before, a formidable one at that. It is a great breaker for Control match-ups that don’t have a lot of sweepers in their rare slots and can turn a midrange match-up on its own. 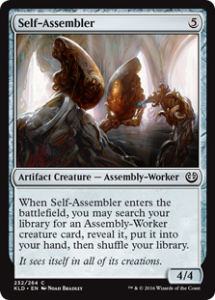 Is that all there is, did you just read the comprehensive list of every card you will see in people’s sideboards? No, obviously not. There are still a lot of other factors to take into account. People saving uncommon slots for their sideboard or having extremely narrow needs or cards that interact better with their main deck than the options suggested in this list. But usually those people know what they are doing or what exactly they are looking for. 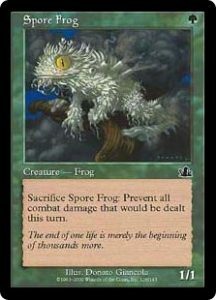 And, it might be incomplete, cards may be overlooked, so let us know in the comments about that great sideboard card that was overlooked.